Website design for lawyers Richmond VA. The characteristics of a great law practice website design are a clean, professional easy to navigate design. See our attorney website clientele page here: Website design for lawyers. A successful law practice website communicates all important practice areas at a glance. There is no ambiguity with respect to what the law firm provides in legal services. VISIONEFX applies agency level design skills in building the perfect interface. How does a small law firm compete on search engines? Competition is hot and heavy for law firms competing for search terms like; personal injury, auto accident, motorcycle accidents, wrongful deaf, DUI attorney and the list goes on. The SEO professionals at VISIONEFX build your website with all the necessary implements to rank well on search engines. 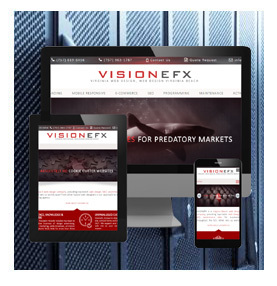 VISIONEFX is an experienced web design company based in Virginia. We build bold, dynamic websites. We understand that great design elevates web sites above the rest and work to provide you the very best in search optimization searches and web design. There is no such thing as the ‘best’ software for a website; rather we choose the best software that fits your needs. VISIONEFX provides custom websites, database development, Word Press customization, Joomla, Drupal, Fusion and Open Source development. Call: (757) 619-6456 or email info@visionefx.net.